George Wildman - Popeye #129, Complete Story Original Art, Group of 2 (Charlton, 1975). Two complete stories by George Wildman, including a eighteen-page tale, "Popeye in Voyage of the Small Fry," starring the Sea Hag, and a the four-page story, "The Lock-Mess Monsker." 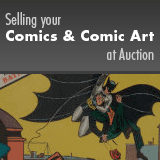 Each page has an image area of 10" x 15", and they average in Excellent condition. The first story is signed by George Wildman on the first page.